BYU football • Former assistant says he's a "scapegoat." Trent Nelson | The Salt Lake Tribune&#xA;BYU coach Bronco Mendenhall, Jaime Hill, and Paul Tidwell yell out to the BYU defense during the second half, BYU vs. Nevada, college football Saturday, September 25, 2010 at LaVell Edwards Stadium in Provo. Trent Nelson | The Salt Lake Tribune&#xA;BYU defensive coordinator Jaime Hill in the first quarter as BYU faces Air Force at the Air Force Academy, college football Saturday, September 11, 2010. Trent Nelson | The Salt Lake Tribune&#xA;BYU football defensive coordinator Jaime Hill, BYU vs. Utah State University (USU) college football Friday, October 3, 2008. Trent Nelson | The Salt Lake Tribune BYU football defensive coordinator Jaime Hill, BYU vs. Utah State University (USU) college football Friday, October 3, 2008. 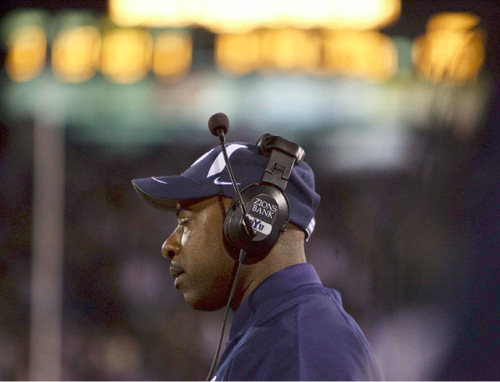 Provo • Brigham Young University's worst start to a football season since 1973 has cost defensive coordinator Jaime Hill his job. 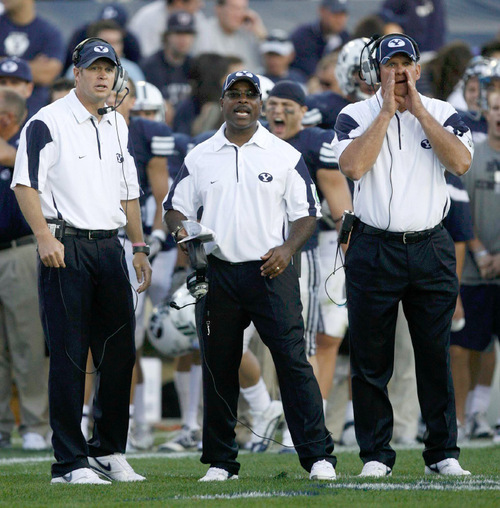 Hill, in his fifth year on the BYU coaching staff, was fired by coach Bronco Mendenhall on Saturday morning during a meeting that also involved athletic director Tom Holmoe. Hill said he believes he's a "scapegoat" for the Cougars' 1-4 start, which included Friday night's 31-16 loss to Utah State in which the Cougars gave up 434 yards of offense to the Aggies, including 242 on the ground. Hill was given the option to resign or be fired, and chose the latter, according to a source close to the situation. Mendenhall confirmed the firing in a school news release, saying, "Defensive coordinator and secondary coach Jaime Hill has been relieved of his duties as an assistant coach on the football staff." Mendenhall will assume Hill's play-calling responsibilities, and former BYU linebacker Kelly Poppinga, who has been a graduate assistant on the staff, "will assume responsibility as a defensive coach on the staff for the remainder of the season," according to the release. School officials said Mendenhall will have no further comment on the matter until Monday. 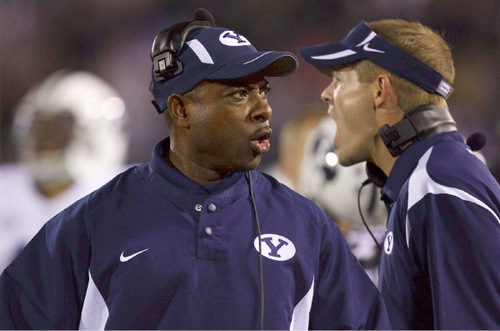 It's the first time in his six-year tenure as BYU's head coach that Mendenhall has fired an assistant. Mendenhall acted as the defensive coordinator his first three seasons before turning the reins over to Hill in 2008. Hill began calling the defensive plays in 2009. The San Diego native said Saturday he did not resign. "I was fired," he said. Former BYU defensive lineman Jan Jorgensen, a four-year starter, called it a "good move" and "something that needed to happen," when reached by telephone Saturday afternoon. "Coach Hill was a really good secondary coach, but not so much when it came to calling the entire defense," Jorgensen said. Another former player, who asked to remain anonymous, said Hill's volatile run-ins with players and other coaches were commonplace. The coach had to be restrained from tangling with offensive center Terence Brown last spring, for instance. The Cougars' defense is among the worst in the country this season. It was 102nd in total defense, 118th in rushing defense and 86th in scoring defense (among 120 schools) before results from the weekend were tabulated. Hill played collegiate football at Grossmont Junior College and San Francisco State University. 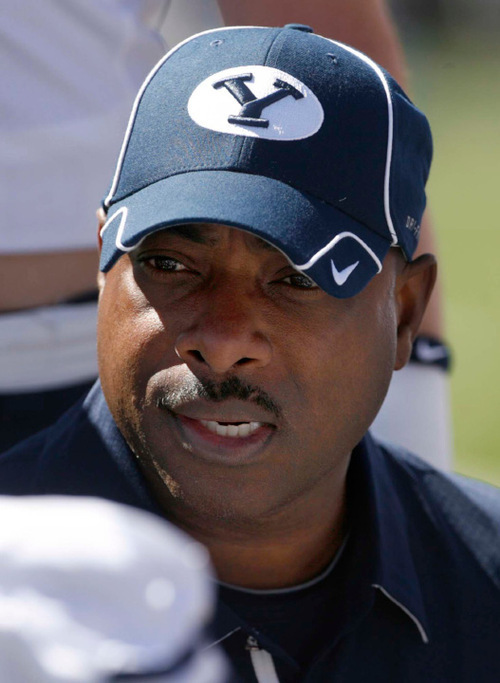 Before arriving at BYU, Hill was co-defensive coordinator for the Ottawa Renegades of the Canadian Football League. He has coached at 10 other places in professional and college football; His four and a half years at BYU was his longest stint anywhere. The Cougars played most of the second half Friday without two of their best defensive players, linebacker Jordan Pendleton and safety Andrew Rich. Rich suffered an upper-arm contusion and Pendleton went out with a sprained knee. Both players were X-rayed after the game and both X-rays were negative.